At least it pretty much is here in Michigan. I know my southerners are still basking in that warm summer-ish sun. Kiddo went back to school on the Tuesday 8th. Everyone is falling into a new routine. Things can slow down a little bit this weekend because football preseason is over and Sunday the 13th is the first Detroit Lions football game and they’re in San Diego. I believe the first home game is on the 27th against Denver. I have to giggle a little about the creation of Detroit cupcakes. Since my family is rooted here, it was only natural that I somehow became a fan of all things Detroit team related. I would come home to visit while I lived in Oklahoma and it seemed like my grandpa always had some sort of sport playing on the television or we were going somewhere to cheer someone. I was probably the only person in my Oklahoma school running around with Detroit Pistons Bad Boy basketball shirts. 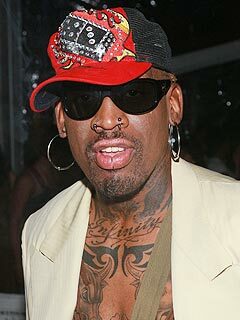 To this day I am still a fan of Dennis Rodman. But, growing up in Oklahoma, a state with no major sports teams (at the time) and only a handful of minors, I did what most okies do. Latch on to the Dallas Cowboys. I spent hours of my life cheering for Emmet Smith and Troy Aikman. I watched the team go up and down and up and down. I laugh at all the jokes people make about the team now. But, that pretty much holds true for all the teams out there. Some people are just so serious about the team they defend. I’m so out of touch with Dallas these days it seems only natural I latch back on to Michigan teams. I’m ok with that. I don’t take it too seriously and for me, it’s just something fun to do. Although, I’d much rather watch sports in person instead of on television with people screaming at the tops of their lungs. Ok. Let’s get this baking party started. -Scoop batter into cupcake paper liners until ¾ full. -Remove from cupcake tin and place on a wire rack to cool completely before frosting. -If it doesn't cream add several drops of the heavy whipping cream until it creams. - Add more powder sugar ½ C at a time.... mix well. -Equally divide frosting into 2 bowls. The first bowl remains white. The second bowl add several drops of blue gel food coloring. Stir to mix well. -If ready, scoop the blue frosting first into a pastry bag then spoon the white frosting on top of the blue with a large star tip. -Frost from the cupcake edges inward to the center of the cupcake. -If icing is not stiff enough add ¼ C powder sugar. Divide the icing into 3 bowls. -Add several drops of blue gel food coloring into the 1st bowl of icing. Stir well to mix. -The rest of the icing remains white. -Locate a picture of the Detroit Lion logo on Google. Print the picture in color. Tape this picture with small numerous images of the logo on it to a cookie sheet. -Tape wax paper (covering the copies of the logo) to the cookie sheet . Follow the color and features as printed on the paper. -Using a small pastry bag fill with the white royal icing and a #2 tip. Start by outlining the image. -Using a small pastry bag filled with the blue royal icing to fill in the body leaving the accent markings clear (the eye, mouth and fur markings). -Make sure that the image is dry, gently touch one of them with your finger if it allows you to push in on the icing allow it to dry more.... If the image is dry then it will have a hard feeling not allowing you to push in on it. -Cut the wax paper holding the completed image into squares surrounding the completed design. -Once the image is dry peel them the wax paper off the back of the logo and place it on the frosted cupcake. So, as I sit here stuffing my face with Detroit cupcakes, I’ll remind me of all the happy memories of my grandparents and all the love they shared with me through the years, even at 2000 miles away. These look so good! 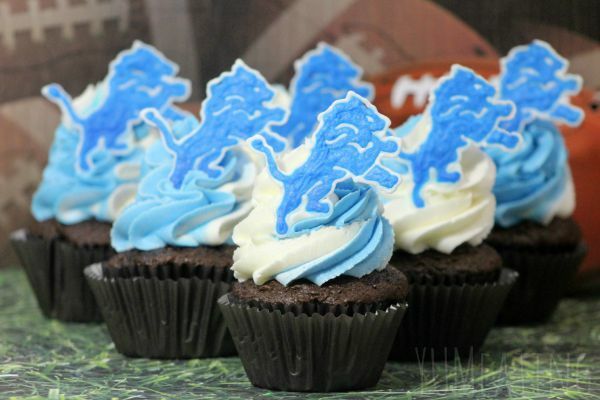 I actually know nothing about the Detroit Lions, but I wouldn’t mind eating these cupcakes. I’m for whichever team has the best food lol. Yum! Those could be any team for me. I just want to eat them! That’s some crazy work doing all those Lions, but they are beautiful. I’ll need to make some for the Georgia Bulldogs! 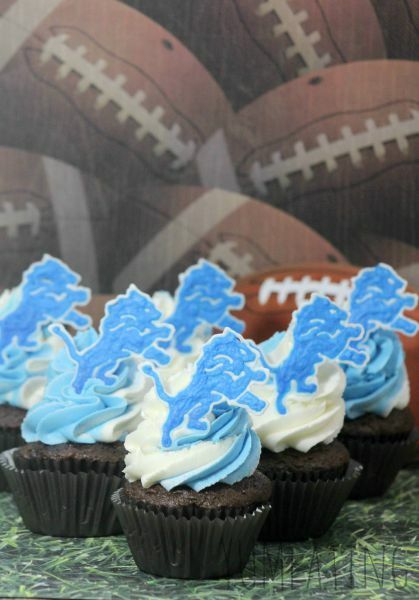 I wish the Lions were my team because these cupcakes are just adorable. I think I’ll switch loyalties just for these yummy treats. Die hard, addicted, obsessed Dallas Cowboys fan here! Growing up watching them in the 90s sparked my love and I am totally one of those people that will defend my team until the end, only I do so with actual facts and football stats. Regardless, these cupcakes look scrumptious, but I will take mine with a star please! You did a great job with those toppers! I may have to try my hand at making some Notre Dame ones for myself! Oh how cute! These turned out amazing. Love them! Not a football fan but would so eat these! I would make Ottawa Senators cupcakes. We hare a huge Hockey family. We love to go to the games as often as we can. These cupcakes look delicious. These are amazing Chrystal! The lions are really fantastic. What a great treat for football season! Those are yummy looking cupcakes! I want one! Love the dual colored icing! I am always envious of people who can make things like this… I could try this, but not sure they would look like lions! These are adorable! You did an awesome job! And I love Dennis Rodman too LOL! What cute cupcakes and a fun story to go along with it. Those are so awesome! I’ve got to make some of these in a Dolphins theme. I love it! My husband is a Detroit lions fan! We are from Wisconsin 🙂 Now if only I could bake! I have no preference when it comes to teams. A cupcake is a cupcake! Yum! These cupcakes look delicious! I love football season and making these cupcakes will make it that much better! You are so talented – these came out so good! I would love to make these for a game day! Not sure I can do Lions ;-). Next game day I might just make these! The cupcakes look amazing and I’m sure they taste yummy, too. I’m not sure if I can do the toppers, but iI would definitely make the cupcakes. Love the creative design topper of those cupcakes. Looks delicious too! These look so delicious and easy to make. I will have to try them on the weekend. I hope mine turn out as well as yours did. My grandfather loved the Detroit lions. He was born and raised there and would have loved to eat these! I wasn’t a huge follower of Michigan teams but I did watch the big games. This is such a cool way of making logos work on cupcakes! that frosting? awesome. I need to make some for the steelers! Loved the Cowboys in the 90’s. Current day, I am really not much of a pro-football fan. We live in Dallas though so the Cowboys are what everyone seems to talk about this time of year. Love the cupcakes you made! They look awesome! These are so cute! And the perfect color to make for where I live in NC to celebrate the Tar Heels! 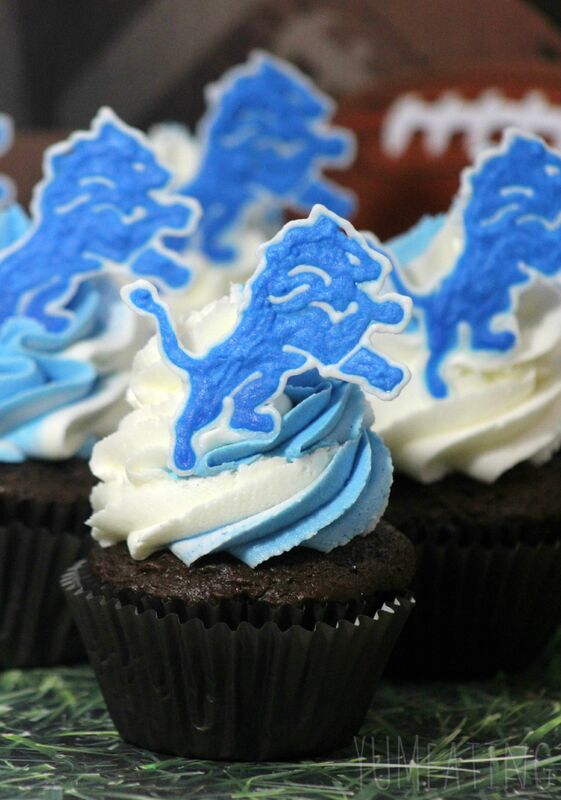 The lion cupcake topper looks really nice – very fun for a fan. I would make Pittsburgh Steelers cupcakes…wish they had something nice to put as a topper other than the helmet.